Dunquin Irish trio (sometimes a duo) was born about fifteen years ago to play the traditional music of West Kerry in Ireland; since then, the band has branched out to other Celtic music and even Scandinavian music. The town of Dunquin in County Kerry was a major embarkation point of Irish emigrants to America; hence our name reflects a strong Irish-to-American connection. Dunquin performs at festivals and events in Minnesota and Wisconsin, including the Minnesota Irish Fair and several historic sites. Dunquin presents several concerts every year and is available for weddings, parties and celebrations of all kinds. Dunquin has recorded two studio albums and several live concerts. 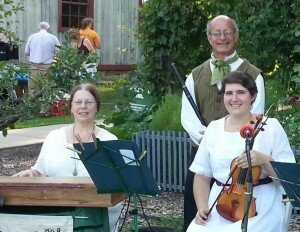 Its members include Sherry Ladig (piano), Don Ladig (flute and whistles) and Rosa Wells (fiddle). Contact Sherry to arrange a booking!